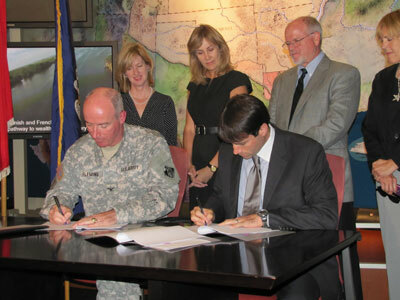 NEW ORLEANS, LA – The U.S. Army Corps of Engineers and the State of Louisiana’s Coastal Protection and Restoration Authority have signed a noteworthy Project Management Plan and Feasibility Cost Share Agreement to move forward on the Mississippi River Hydrodynamic and Delta Management Study (MRHDM). Designed to enhance coastal restoration efforts, the study will investigate existing water and sediment resources in the Mississippi River that could be used for restoration purposes without compromising the river’s existing navigation and flood control functions. “Re-designing the Mississippi River is foundational to our future in south Louisiana. We must reconnect the historic distributaries of the Mississippi River to allow the river to begin building land once again. While this study will not affect or further delay the seven diversions that were authorized for construction in 2007, it will play an important role in guiding future projects to provide for navigation, flood control and coastal restoration,” said Garret Graves, Chairman, Coastal Protection and Restoration Authority. The MRHDM project has been identified as a large-scale, long-term restoration feature recommended for study by the Louisiana Coastal Area program. The study effort will include data collection and modeling, and would assist in determining the need, location, size, and seasonal variations for planned diversions and future restoration projects. This effort is intended to produce a dynamic model capable of evaluating multipurpose management scenarios of the river, which is important to the Nation and the long term sustainability of coastal Louisiana. Work on the study will be shared by the U.S. Army Corps of Engineers, New Orleans District and the State of Louisiana’s Coastal Protection and Restoration Authority throughout the development of the comprehensive model. For more information, please visit www.lca.gov.